PT Kimia Farma (Persero) Tbk - Kimia Farma (IDX:KAEF) is an Indonesian state-owned company that is involved in pharmaceutical and health care industry. It's business include pharmaceutical manufacturing, trade and distribution, pharmaceutical retail and international trade. 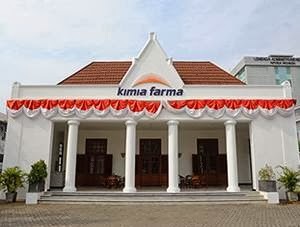 As a state-owned company, Kimia Farma is majority owned by the Government of Indonesia. At present, 90.025% of its shares its shares are held by the Government of Indonesia, 0.152% by the management/employee of Kimia Farma, and 9.823% remaining shares by investor and public shareholders. Kimia Farma is based in Jakarta and now has 4 key subsidiary/affiliated companies, namely PT Kimia Farma Apotek, PT Kimia Farma Trading & Distribution, PT Sinkona Indonesia Lestari and PT Kimia Farma Diagnostik (subsidiary company of PT Kimia Farma Apotek). Kimia Farma's head office is registered at Jl Veteran No 9 Jakarta Pusat. Kimia Farma's business results in the first half of 2015 ( 1H 2015, ended in 30 June 2015) showed improved performance compared to the same period at 2014. According to Kimia Farma's 1st semester financial report 2015 as quoted by JobsCDC.com, PT Kimia Farma (Persero) Tbk recorded a growth of 11.02% in total revenue amounted to Rp 2,108.79 billion (unaudited) over the same period previous year (Rp 1,899.39 billion in 1H 2014/unaudited). Kimia Farma’s current year profit was Rp 79.81 billion (unaudited), 11.56% higher than the previous year of Rp 71.54 billion (unaudited). Background in Bachelor Degree (S1) or Master Degree (S2). Minimum 5 years of experience as Business Development Manager. Have a good knowledge of strategic planning. Have a good knowledge of strategic business analysis. Have a good knowledge of project management. Have a good knowledge of strategic management. Have a good knowledge of risk management. Have a good knowledge of marketing management. Have a good knowledge of macro economics. Have a good knowledge of pharmaceutical business. Love the challenge and have high endurance. JobsCDC.com now available on android device. Download now on Google Play here. Please be aware of recruitment fraud. The entire stage of this selection process is free of charge. PT Kimia Farma (Persero) Tbk - GM Business Development Strategy Kimia Farma March 2016 will never ask for fees or upfront payments for any purposes during the recruitment process such as transportation and accommodation.